Create a new document: 1024×768 px (or any other size – just as you wish). - Colors / Brightness & Contrast -25 / +55. You should get some whie dots on a black background. Name this layer “small stars” or “kleine Sterne” (as me). Duplicate the layer (the background-layer), name it “big stars” or “große Sterne” (as i did). Again choose Brightness & Contrast from the colors menu: -70 / +40. Now we have to enlarge this layer by doubling the size. That helps us to make the small stars on this layer even bigger so that they become bigger ones. Press SHIFT+T (or use the scale tool) and enter 200% as value. We’re going to enhance these stars to make them better visible. - Invert the layer by Color / Invert. That is to see the stars better. - Colors / Threshold. Click the “automatic”-button to the right. Our dots should now be much better visible. Now invert the layer again (Colors / Invert) to see a black layer again. Scale the layer back to its almost original size. Press Shift+T and enter 53%. Position the layer in the middle of the image. The easiest way to do this is to use the alignment-tool (which is a new tool since GIMP 2.3.x series). - The preferences of this tool should become active now. - Then click both middle icons in the preferences to position your layer exactly to the middle of the screen. In the layers-dialog choose “Screen” in the layers mode dropdown menu. Now we have a zoom or echo-effect. To avoid this we simply rotate the layer by 180°. (Shift+R to use the rotate tool: enter 180°). We’re nowgetting to the point in which we give our plain starfield some live. Use the free selection tool (F) and select randomly all over the layer. This is a wild action ;) View my picture to see what i mean. Grow the selection (Selection / Grow: 8px) and after that delete the selected parts in the picture by pressing DEL (or CTRL+K if you still use GIMP 2.2). There should be only some big stars left in the image. Create a new layer below the “small stars” layer (“kleine sterne”). Fill this layer totally black. Now lets activate our small stars layer. Right click the layer in the layers dialog, choose “Add alpha channel”. Again use the free selection tool to select some parts of the image by random move the selection tool all over the layer, but it should be much less than the wild selection in step 7. Selection / Feather: 50px. Remove the selected area by pressing DEL. The small stars should be still crearly visible but some parts are darker or completely black. The next step is pretty easy: Image / Merge Image. Name this layer “Stars”. Now use the clone-tool, in the preferences choose “Screen” in the layers mode drop down. Now use the “Sparks”-Brush (the yellow one). We’re randomizing our stars now so that they look real. This step is easily done. Set a starting-point by holding down CTRL and click a part in the image. Then simply paint at any other part of the image. The area is then copied all over and added to the current position. They’re added because we use the “screen”-mode in the preferences. That means that our stars never become less – the become more all the time. If you want lesser stars in an area you need to change the mode back to “normal” and clone a region that contains only few stars. Lots of text ;) now just start to give your space live! and repeat the action of cloning. Duplicate the layer. Name it “Stars glow” or “sternen glühen” as me. - Set the layers mode to “addition” or “screen”. Your starfield should now glow blueish. If you want to have it glow even more just duplicate the glow layer. Now some rather small steps follow to give our picture more cool details. We will make some bright glowing stars. Create a new layer: fill it black. Having the filter dialog open enter any values you like to create you shining star. But don’t make it too big for the first time and place it in the middle. Set the layers mode to “Addition” and move the layer to any position you want to have the star. Duplicate it, scale it (SHIFT+T) to a smaller or bigger size and move it to any other position. Optional: You can add some more color if you like. To do so you simply have to select the appropriate area in the “stars glow” layer with the free selection tool, feather this selection, and the apply Colors / Colorize to change the color of that area. My final starfield looks like this. Have fun creating you very own starfields ;) This can also be nicely used as a wallpaper. This topic (Create a cool starfield) has been rated 5.0/5.0. im trying to get the basic small and medium stars,the beginning . im trying to do this at a 3500 pxl plus. its not working. it feels like thr filters dont match the size. getting just a box of tv fuzz .cant get the dots bigger and spaced out. how do i do this in a large pic? Loved this tutorial, it's really nice. Thank you for this! For those who can't find "Selection > Fade" --they renamed it since this was made, and I *think* it's "Selection > Feather" for now. very well done tutorial. Exactly what I needed. For the people having trouble with step 10: Do not create the stars in step 1 in the initial background layer, instead create a new layer with transparent backround, and start from there. The initial background layer has no transparency (I do not know why). I meant "step 10 can't fade out the image"
of all the times to make a mistake! Again, if anyone can explain what I've done wrong, please tell me! Thanks in advance once again! Hi, I've been trying to complete your tutorial but have been having problems with it. When I get to step 10, I can fade out the image. There is no fade tool under the select(ion) menu and the fade tool under the edit menu is greyed out and does not want to work and when I delete the selection i just get a bunch of lovely white spaces. After that in step 12 when I merge my layers all I get is a star filed dotted between all the white space - can anyone tell me whats gone wrong here and how I can fix it please? 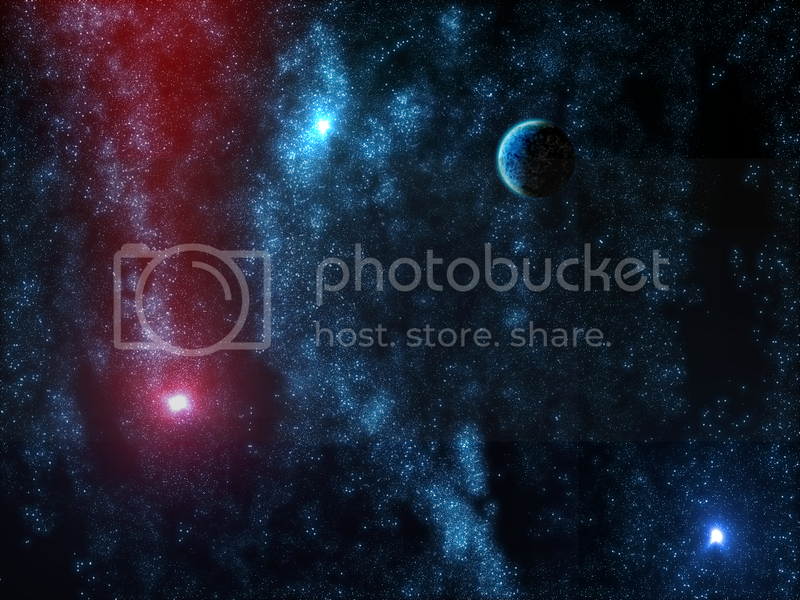 This is one of the best Starfield tutorials based on GIMP and I would love to complete it! Thanks in advance! when I make the big bright stars, I keep having trouble with boxes around them throwing the whole area off color, how do you stop that? i did it for around 2 or 3 times, but everytime i got some problem on the step 13. Thank you for this great tut. It is really useful and clearly explained. You not ment to use free select, i would use the lasso tool if I were you. I think you can delete the 'green line' by choosing another tool, but I can't remember, I haven't used that pathetic tool for a long time. I used your settings at the beginning, but it gave me zero stars, and the hue came out red when it worked. I'm using the newest version of GIMP, so maybe that's it? I'm not sure, but I eventually figured it out, albeit after a looooong time of tweaking settings. Thanks for the tut. though. I tired this many times before I got it right very nice tutorial though! My Problem is the Same as Gimpkid25 's I am Stuck on step 7 Because when i use the free selection tool its a green line and wont go away... Plus when try to go to Select/grow it wont let me choose grow. Some Help would be Nice seems like it will be very cool... Thanks! I relly ike this effect and everything its really cool and great for any picture, but I have a problem. I get lost at step 7 where you use the free select tool, how do you grow the selection and the free select won't go away? Mainly this is the part I'm getting stuck at. "Grow the selection (Selection / Grow: 8px) and after that delete the selected parts in the picture" Please help because I really need this effect to finish a picture I'm making. Thanks mate, this is just what I needed! An easy tutorial yielding awesome results! Great tutorial!! Very easy to follow and the result is beautiful!! im using 2.6 and couldnt find some some of the steps. Also, mine looks nothing like the star field and i followed the steps i could do. i got up to the sparks just fine, after that it went down hill. I am using 2.6 and cannot find the "screen" option. I have tried a few tutorials and gimp 2.6 is different in every one. So frustrating. hey man i'm using gimp 2.6 and I can't find "colors / threshold"
Been making starfields all night ;) Thanks! Thank you I had the same problem with the fade. Fade is only used (under edit)when you only use fill or blend. i can't find the fade. This is the amazing. keep up the good work, i mad one and added other things to it. this is awesome, i just made one. Really nice tutorial... I am going to use the image I made as a background for a game. Thanks. Wow... extremely realistic and visually appealing. Well put together. Amazing. I made my own and set it as my desktop. Thank you! Omg! That's a REALLY COOL tutorial! Fantastic! Thanks a lot for publishing that article. I could not get the part with Color / Colorize to work on my GIMP 2.4.2 in order to change the star glow color. That's no problem though, once you got the general method you can easily come up with variations to get the desired effect. Thanks for the tutorial. Indeed very cool starfield!